The room 91 of the Uffizi Gallery is dedicated to Bartolomeo Manfredi (1582-1622), an Italian painter defined Caravaggesque, because of the strong influence that the work of Caravaggio had on his painting. Manfredi met Caravaggio in Rome. The naturalism of the master\'s works struck him deeply. In particular, Manfredi took inspiration from the genre scenes. This kind of scenes became central in his personal style. In his works, therefore, we often encounter tavern scenes, characters such as soldiers and musicians. Bartolomeo Manfredi was admired by some painters from Northern Europe, as Gherardo delle Notti (Gerrit von Honthorst), another great artist, whose works are exhibited at the Uffizi. In the Uffizi room four works by Manfredi are exhibited. In the Florentine museum there was also another painting by the artist, the musical concert, destroyed by the bomb in Via dei Georgofili. The Tribute to Caesar represents an episode of the Gospels, in the style that characterizes the last phase of Manfredi\'s painting. The background is very dark, and the characters emerge by contrast. The Roman Charity depicts a fairly common theme among Italian and Flemish painters in the modern age. The young Pero, to save his elderly father Cimon, imprisoned, feeds him with the milk of her breast. Manfredi represents the drama of the moment with realism and richness of detail, as the tension of the girl and the man\'s physical suffering. 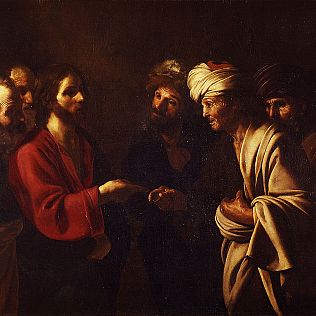 Other paintings by Manfredi displayed in the room are the Dispute with the Doctors and the Mocking of Christ.